Despite more than 90% of Chinese feeling that they enjoy a higher standard of living than their parents, concerns over corruption, social inequality and food safety are growing, according to a Pew Global Attitudes Survey. Most presidents and prime ministers would love to have the kind of GDP growth China's incoming leader Xi Jinping will inherit. The fact that forecasters now predict China's growth may "slow" to below 8% next year will probably elicit little sympathy from Greece's Antonis Samaras or Spain's Mariano Rajoy. But by recent Chinese standards growth figures like this are a disappointment. A slowdown is particularly troubling for Xi because, as China prepares for its once-in-a-decade leadership transition, a Pew Global Attitudes survey conducted there this year finds that its citizens are also increasingly worried about a variety of other domestic issues, especially corruption, inequality and consumer protection. In many ways, these rising concerns all revolve around the idea of fairness. In the realm of politics, many see a system in which the politically well-connected regularly parlay their positions and networks into considerable wealth. In the economic realm, while standards of living have improved for the vast majority of Chinese, and the country's middle class has expanded tremendously, there is nonetheless a widespread belief that not everyone is enjoying their fair share. And as consumers, many Chinese feel at the mercy of a system that cannot guarantee the safety of life's basic necessities. The growing gulf between rich and poor in China is certainly something that worries China's leaders. In their 10 years in power, Hu Jintao and Wen Jiabao pledged they would create a "harmonious society". 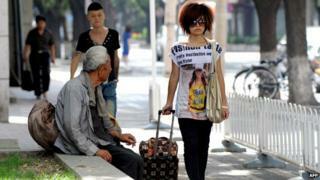 Instead inequality has risen - the World Bank says China is among the most unequal countries in Asia. China's leaders have been responding. By slowing growth down to less than 8% a year and trying to "rebalance" the economy towards service industries and consumer spending they hope to create more jobs and encourage spending. They have called for minimum wages to rise by more than 10% a year until 2015. They say they have almost completed a national pension scheme covering all rural areas for the first time. But the problem of inequality runs deeper. Many on the lower rungs feel discriminated against in all sorts of ways - be they farmers whose land is appropriated for development or migrant workers who can't get social benefits in cities. For China's next generation of leaders, tackling inequality of incomes is a priority. But what may be even harder will be to create a more equal society for all, be it in access to services, to opportunities or to protection under the law from abuse by the state or the powerful. Of course, the Chinese are still more satisfied with the state of their country than many other publics around the world. And they have certainly weathered the global economic downturn better than most. In a Pew Global Attitudes survey conducted in March and April of this year, 70% of Chinese said they were better off financially than five years ago. And 92% said they enjoy a higher standard of living than their parents did at a similar age. Still, the same poll, which had a disproportionately urban sample in China, highlights the extent to which many Chinese are struggling to cope with the side effects of economic growth. Six in 10 describe inflation as a very serious problem. About a third say this about air and water pollution. And the cultural impact of rapid change worries many - roughly 70% believe their way of life needs to be protected against foreign influence. But three issues in particular emerge as growing concerns. First, the poll, which was conducted as the initial details of the Bo Xilai scandal were coming to light, finds growing concerns about political corruption. Half say corrupt officials are a very serious problem in China, up from 39% in 2008. Second, there is a consensus that some people are being left behind by China's rapid growth - 81% of those polled agree that today the "rich just get richer while the poor get poorer". Nearly half (48%) describe the gap between rich and poor as a very big problem, up from 41% four years ago. And in another sign that many do not see a level economic playing field, less than half (45%) agree with the statement "most people can succeed if they are willing to work hard". Among the 21 nations surveyed by Pew, only Greece, Italy, Japan, Russia and Lebanon had fewer people saying hard work leads to success. Third, and perhaps unsurprisingly given the number of high profile product safety scandals in recent years, the Chinese public is increasingly worried about consumer protection. Roughly four-in-ten (41%) now consider food safety a very big problem, up from just 12% in 2008. During that same time period, concerns about the safety of medicine have more than tripled, from 9% to 28%. Similarly, the percentage saying they are very worried about the quality of manufactured goods has jumped from 13% to 33%. After three decades of remarkable transformation, the Chinese public acknowledges the country's economic success, but there are clear anxieties about the way forward and clear concerns that opportunities and rewards are not being distributed fairly. "China today is a land of huge disparities," says writer Yu Hua. "It's like walking down a street where on this side are gaudy pleasure palaces and on that side desolate ruins." If discontent with key elements of political and economic life continues to grow, navigating this street could prove difficult for Xi Jingping over the next decade.